After two wonderful reinterpretations of classical events - The Ten Thousand and Corvus - I was both having great expectations and great doubts about the logical conclusion of the series in "The Kings of Morning". Expectations because I really like how Paul Kearney's writes and his Ten Thousand were the best in modern fiction (and I read a few other reinterpretations from Michael Curtis Ford and Valerio Manfredi), while Corvus managed to dispel my original doubts and create a Macht analog of Alexander and a unifying war that worked. Doubts because as opposed to both Xenophon's campaign (The Ten Thousand) and Philip and Alexander Greek wars (Corvus), I read a ton about Alexander's Asian campaign and his successors wars for that matter, most notable recent such being God of War, the masterpiece of Christian Cameron, and the fantasy-nal reinterpretation of Alexander's aftermath by Jo Graham in Stealing Fire, part of her wonderful "Numinous World" series. And the doubts proved founded since The Kings of Morning did not really work for me as it got too close to fraying my suspension of disbelief on two related counts. First the Alexander parallels are too pronounced here for the everybody lives happily ever after stuff and second The Kings of Morning gets very near war as escapism. The author's skills can disguise a lot of the above, but ultimately this book lacked three dimensions and read too much as clear escapism Hollywood style; this may work in a pure fantasy setting, specially one that does not take itself too seriously, but here with the classical model, the book is found wanting and I could not help feeling that reading God of War and then reading The Kings of Morning is like reading a serious book for adults, followed by a simplified children's one on the same theme. For good measure I reread Stealing Fire too just too see if/how a fantasy-nal novel can compare and I found it even better on second read with wonderful prose, three dimensional characters depth and subtlety, all which The Kings of Morning sadly lacked. 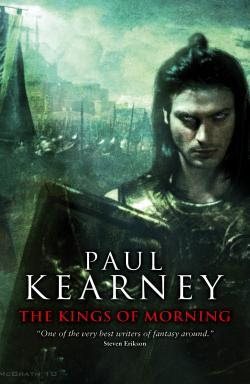 Overall, if you can take The Kings of Morning on its own, you may enjoy it more, but if the historical parallels dominate, the book is sadly lacking in comparison with what's out there.